To add items to your Home, click on the edit icon to the right top corner of the page. Enter a release date – when you want the item to become viewable in your home page. Then, select the type of content you will like to add to your home page (explained below). Enter a release date (when you want it to appear in your Home). A file browser will appear. If the file that you want to use is listed, double-click on it to select. 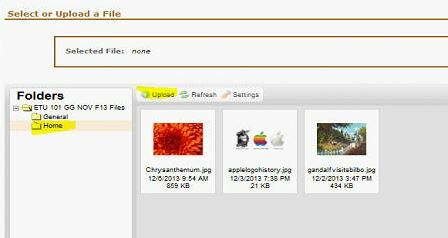 If you want to upload a new file, click on the Upload link in the file browser. Find the file in your computer and select it. You may also drag and drop it in the file browser. Tip: Save your images for the web (recommended resolution is 72 pixels) for faster loading. Once your file has been uploaded, double-click on it to select it. Note: In order to meet accessibility requirements, all images in your Etudes course site must have alternative text descriptions. Images include photographs, cartoons, figures, and charts. This is for the benefit of our students with low-vision who use screenreader software. Provide a brief description that conveys meaning and significance of each image so that the student’s screenreader will tell the student what the image is all about since they can’t see it themselves. Preview your file and click on Done to save the item as draft. Or, click on Publish to make it available in your Home on the specified date. 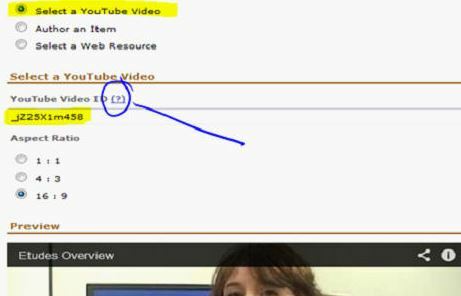 Select the option to add a YouTube video. Enter the id of the video or the URL of the video. Click on the (?) icon for helpful tips on how to get the id. Select the aspect radio for your video. Preview your video, and click on Done to save the item as draft. Or, click on Publish to make it available in your Home on the specified date. 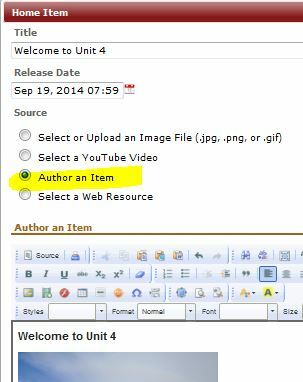 Select the option to author an item. You have the freedom to design an engaging page that includes images, links, and other media, and an informative message to greet your students. For example, it could be that you want to post an image, but you also want to include some text along with it to explain its relevancy to the week’s lesson or your subject. To insert an image in the editor box, click on the Insert image icon, browse and click on Upload to select an image from your computer and use it here. Another example is embedding other types of media with textual information around it. It could be that you want to post slides from SlideShare, Vimeo, YouTube, or another source. Click on the Embed Media icon of the editor and paste the embed code, and then add comments about it for your students. The possibilities of authoring with the editor are endless. Remember that this is not meant to be a lesson. The appropriate place for lessons is in Modules. It’s meant to welcome students to the class, highlight a relevant theme for the week, motivate them, and things along these lines. Once your page is authored, you can preview it just below the editor. Click on Done to save the item as draft, or, click on Publish to make it available in your Home on the specified date. Select the option to add a web resource. Enter the complete URL of your web resource, including the https://. 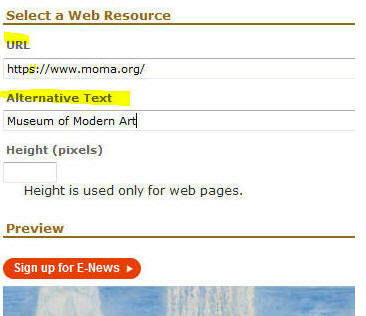 Add a short description of the URL in the Alternative Text field. Add height in pixels for the display of the web page in your Home. (Note: It is advised that you include links to secure resources with https addresses. For security reasons, browsers may not display web pages with http:// addresses to users within a secure server environment, like Etudes). Preview your web resource, and click on Done to save the item as draft. 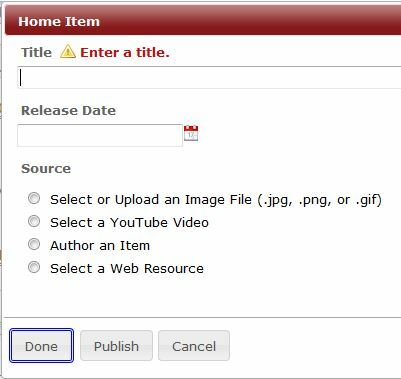 Or, click on Publish to make it available in your Home on the specified date. Home page items and their resources and dates get copied over to new sites with import from site. Home page items participate in the base date functionality.